The first cookbook I ever used on my own was Ina Garten's Barefoot Contessa -- the original one, which I still maintain is the best of her collection. I literally have cooked almost everything in this cookbook -- from the Indonesian Ginger Chicken to the Fresh Corn Salad. Her recipes always are crowd pleasers. 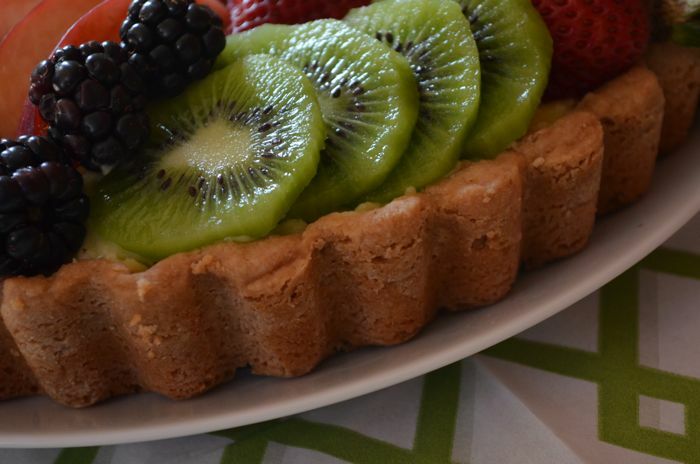 One of my favorites is her Fresh Fruit Tart. I must admit, when I first decided to make it several years ago, I was a bit daunted. But it is surprisingly easy to do. Many times I have just purchased a pre-made crust -- but this time, I thought, "Hey, you're writing a legit blog now, you should probably make the crust yourself." But good news: the crust is pretty darn easy to make as well. Making the fruit tart involves three main tasks: (1) making the pastry cream, (2) making the tart crust, and (3) arranging the fruit. 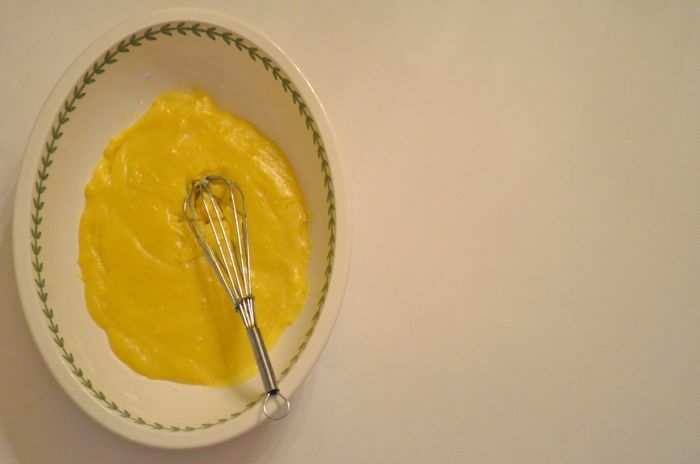 Beat the egg yolks and sugar on medium-high speed for about 3 minutes, until the mixture is light yellow and falls back into the bowl in a ribbon. On low speed, beat in the cornstarch. 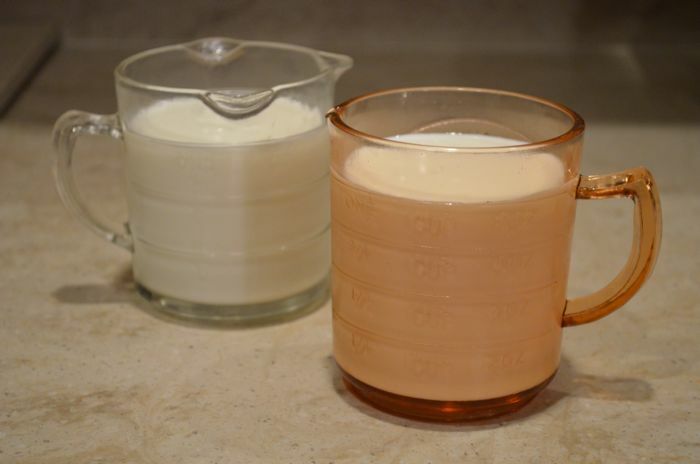 Bring the milk to a boil in a large saucepan and, with the mixer on low, slowly pour it into the egg mixture. THen pur the mixture back into the saucepan. Cook over medium heat, stirring constantly with a whisk or wooden spoon, until the mixture is thick, about 10 minutes. Bring to a boil and cook on low heat 2 to 3 more minutes. Taste to be sure cornstarch is cooked. Remove from the heat mix in the butter, vanilla, cream and Cognac and strain into a bowl. Place plastic wrap directly on the custard and refrigerate until cold. I love these old fashioned measuring cups! Finished pastry cream -- should be a great yellow color! Preheat the oven to 350 degrees. Mix the butter and sugar together until they are just combined. Add the vanilla. In a medium bowl, sift together the flour and salt, then add them to the butter and sugar mixture. Mix on low speed until the dough starts to come together. Dump onto a surface dusted with flour and shape into a flat disk. Press the dough into a 10-inch-round or 9-inch-square false-bottom tart pan, making sure that the finished edge is flat. Chill until firm. Butter one side of a square aluminum foil to fit inside the tart and place it, buttered side down, on the pastry. Fill with beans or rice. Bake for 20 minutes. Remove the foil and beans, prick the tart all over with the tines of a fork, and bake again for 20 to 25 minutes more, or until lightly browned. Allow to cool to room temperature. Finally, the fruit! 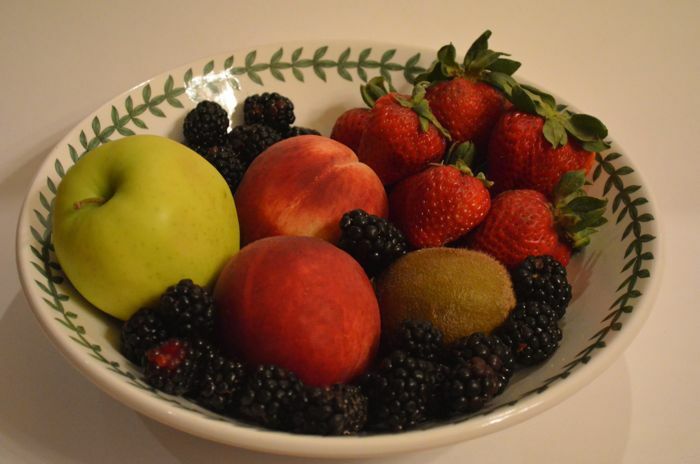 Get a good variety of fruits and arrange how you would like. 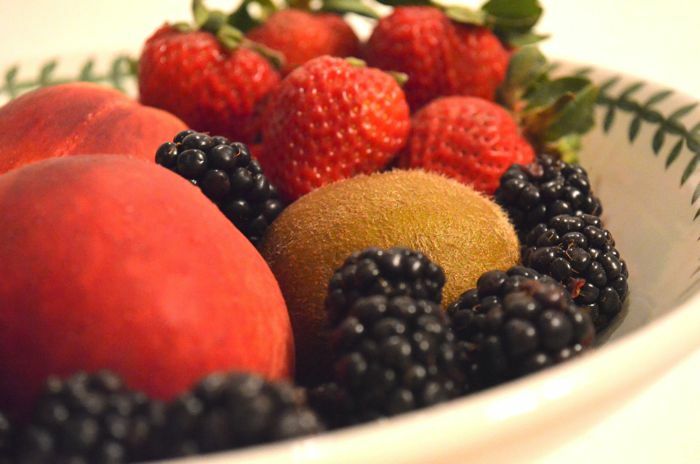 I always try to get blackberries and kiwi. 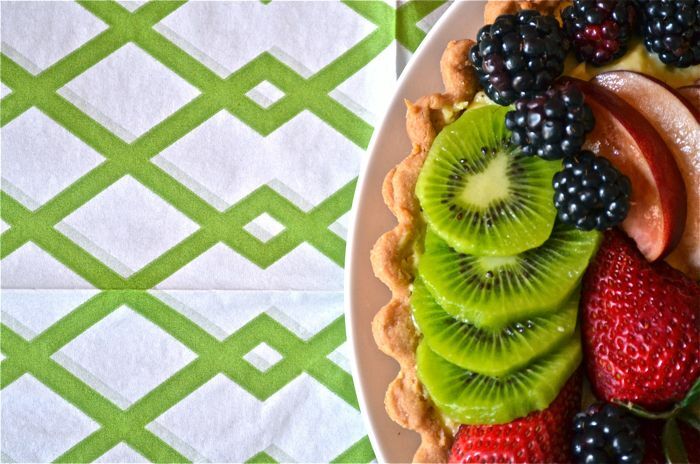 They're beautiful colors and taste divine in this tart.